Ghayath Almadhoun is a Palestinian poet born in Damascus in 1979. He has lived in Stockholm since 2008. Almadhoun has published four collections of poetry, the latest “Adrenaline” in Milano 2017. In Sweden he has been translated and published in two collections: Asylansökan (Ersatz, 2010), which was awarded the Klas de Vylders stipendiefond for immigrant writers. He also authored Till Damaskus (Albert Bonniers Förlag, 2014) together with the Swedish poet Marie Silkeberg. which was included in “Dagens Nyheter” (the largest Swedish newspaper) literary critic list for Best New Books and converted to a Radio Play for Swedish National Radio. With Silkeberg, Almadhoun has also made several poetry films. His work has been translated into Swedish, German, Greek, Slovenian, Italian, English, Dutch, French, Danish, Spanish, Czech, Croatian, Albanian and Chinese. With renowned American artist Jenny Holzer Six poems by Almadhoun has been projected from 25th February – 6th March on the façade of Aarhus Theatre as part of “For Aarhus” a new work in celebration of Aarhus, European Capital of Culture 2017. And from 28th May 2017, four poems by Almadhoun will be projected by Holzer on MASS MoCA, North Adams, Massachusetts, USA. Also Three poems by Almadhoun will be projected by Holzer on the night of June 15th 2017, on in the city of Florence as a collaboration with the city of Florence, between Holzer and the talented and artistic American fashion designer based in Milan Virgil Abloh. Virgil will debut his fall/winter 2017/2018 collection, with an elaborately orchestrated outdoor event in the courtyard of the Pitti Palace. ​Lately he had published together with the Dutch poet Anne Vegter, the poetry collection "ik hier jij daar" (Uitgeverij Jurgen Maas) Amsterdam 2017. ​“Adrenaline” a poetry collection translated into English by Catherine Cobham is upcoming by Action Books, USA, October 2017. ​"Ein Raubtier, das Mittelmeer heißt" Aa poetry collection translated into German by Larissa Bender is upcoming by (Arche Literatur Verlag AG) Zürich / Hamburg, February 2018. 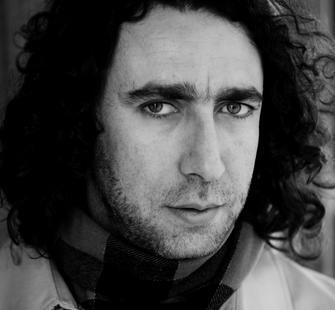 Ghayath Almadhoun's residency is supported by Sveriges författarfond.